Italian men's society members, [Ordine Indipendente Fior D'Italia], Crowsnest Pass area, Alberta circa 1922. Image courtesy fo the Glenbow Archives NA-3903-87. In an age in which Canada’s Charter of Rights and Freedoms guarantees fundamental rights and immigrants, whether economic migrants or refugees, are welcomed, it is difficult to imagine what it was like at the beginning of the twentieth century. While the Liberal government of Sir Wilfred Laurier (elected in 1896) saw the importance of immigration to populate the Northwest Territories, not everyone was welcomed. Preference was given to people of British origin, Americans and Northern Europeans. Peoples of southern and eastern Europe, and Asia were deemed less desirable. Minister of the Interior Sir Clifford Sifton did make an exception for Ukrainians who were viewed as good farmers (about 170,000 arrived between 1892 and 1914) but they were tolerated rather than welcomed. With respect to labourers, Chinese and Italians were treated differently. In spring 1897, the Alien Labour Act limited contract labourers entering the country, particularly Italian and Chinese railway workers from the US. Cornelius van Horne of the Canadian Pacific Railway brought in such labourers to work on the western section of the railway. Italian labour brokers, known as padroni (literally, masters) recruited immigrants in Italy promising jobs, but, in some cases, failed to deliver and charged exorbitant amounts for transportation and lodging. Among the most prominent was Antonio Cordasco of Montreal who supplied workers to the CPR. From about 1901, Cordasco was the sole supplier of Italian workers to the company. In May 1904, a late start to the construction season left about 6,000 Italian labourers unemployed in Montreal and they caused unrest. A Royal Commission was established to investigate labour agents. While recommendations called on licensing, they did not end these practices. Cardasco, however, lost his contract with the CPR. This is the context for Italian immigration in the early years of the twentieth century. While restrictive, Canadian policy did not impede immigration: between 1901 and 1911 Alberta’s population grew more than five times, from 73,022 to 374,295. The number of Italians in the province for select years was as follows: 1901, 109; 1911, 2,150; 1921, 4,028. 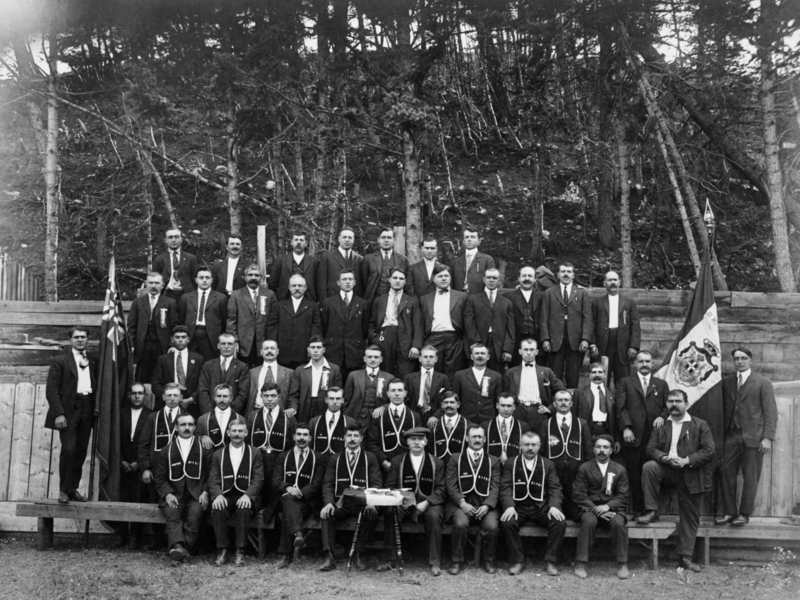 Italian men’s society members, [Ordine Indipendente Fior D’Italia], Crowsnest Pass area, Alberta circa 1922. Image courtesy fo the Glenbow Archives NA-3903-87. Men came to work on the railways, in mines and forestry camps and, some, to farm. Edmonton, Calgary, Lethbridge and Medicine Hat became stopping points but, later places to settle. Oral histories reveal this pattern of migration. Mines in BC’s Elk Valley and the Crowsnest Pass and Drumheller in Alberta were the preferred destinations. Paesani (fellow townsmen) could be counted on to provide room and board and help find work. The fraternal society – Ordine Indipendente Fior d’Italia, headquartered in Fernie and with locals in other mining communities – provided financial support in case of accidents in return for monthly dues. It is difficult today to believe that Edmonton was also a coal mining centre and that its growth was powered by mines along the banks of the North Saskatchewan River. Slope mines between the High Level Bridge and 92 Street initially tapped surface seams; shaft mines were initiated by Donald Ross in 1889. Over 100 mining companies operated from 1880 to 1970. Giuseppe Peccori, who arrived in 1903, Joe Marta, Giovanni Rosso, brothers Giacomo and Giovanni Sartor, Silvio Tona, four Del Bosco brothers, and two members of the Biamonte family worked in those mines. Domenico Chiarello began work as a miner and eventually operated his own mine for 24 years. Francesco De Filippo left Calabria at the age of 17, in 1903, and went to Boston and worked on construction sites as a labourer. Railway building projects took him to the US Pacific Northwest, eastern Canada and back to Jasper, Alberta. He ended up working in mines in Cardiff, Alberta and Edmonton. The majority of miners were union members (United Mine Workers of America translated materials into Italian). De Filippo, for example, was active in the union and became a steward. Slowdowns and closures as well as dangerous working conditions served to radicalize the mining workforce. The 1919 Winnipeg General Strike was the stimulus, on March 13, 1919 for western Canadian union locals meeting at the Western Labour Conference in Calgary to vote in support of the Russian Revolution. They also voted to secede from the American Federation of Labor and Trades and Labor Congress of Canada to form an industrial union to be called the One Big Union. The traditional unions, which were based on craft lines (e.g., carpenters, plumbers, pipefitters, masons) rejected this notion and prevailed. Group photo of coal miners and women. From the Domenico Chiarello fonds, date unknown. Image courtesy of the Provincial Archives of Alberta A10957. Do not reproduce. Joe Centazzo, who worked at the Humberstone Mine, supported these motions. He testified in Edmonton at the Coal Mining Industry Commission in 1919 initiated by the Government of Alberta after the General Strike. The strike began in Winnipeg, and received major support in the coal mining regions of western Canada. John T. Stirling, who had been appointed Alberta’s Chief Inspector of Mines in 1910 served as chair and hearings were held in Edmonton and Calgary as well as coal mining communities. While both owners and workers testified, owners’ views had greater weight since the companies were essential to the Canadian economy. Centazzo recommended that miners carry electric lamps in their pockets in case of explosions so that they could light their way out of the mine; that blankets and stretchers be stored in mines; and that legal limits be imposed to number of hours worked. An article in The Edmonton Bulletin of August 28, 1914 regarding the establishment of an Italian agricultural colony in Venice-Hylo (promoted by the Vittorio Emanuele Terzo Society of Edmonton) gives insight into the community. The society’s membership was fixed at 600, which likely represents almost all of the Italian residents of Edmonton. Felice de Angelis, a civil engineer and Italian consular representative, procured homestead documents and the society supplied basic tools, tents and foodstuffs. This was the second group to go up (20 families); the first had left on July 27, 1914. A clipping from the same year features a photograph with a hunting dog and children in fancy dress under the title “Leaving for a Different ‘Front’.” The caption notes: “There has been some doubt since the European war began, whether Italy would join Germany and Austria, her allies according to the ‘Triple Alliance’ or turn against them and fight side by side with Britain. There is, however, no doubt as to where the sons of sunny Italy shown in this picture stand.”  The society was established in 1913 under President Lorenzo Cantera, who came to Edmonton from the US in 1912 and lived in the Rossdale Flats. Venice was western Canada’s second Italian colony: in 1905, a small settlement was established in Naples. Settlers from both ended up in Edmonton as the rigours of prairie agriculture overwhelmed all but the hardiest. In an article in Il Congresso (February, 1991), Len Bonifacio throws additional light on the colony. He recounts that the settlers, from northern Italy, arrived in New York in 1911 and worked on the railroad in Boston before moving to Kansas to work in the coal mines. Via the community grapevine, they heard of work on Canadian railways and headed for Winnipeg. They worked for the Grand Trunk Railway and, eventually, came together in Edmonton where they lived in a rooming house and worked on construction of the High Level Bridge. Some wives joined them in 1913. Francesco and Carolina Rusconi with daughters Angela and Florence at 11844 106 St., Edmonton circa 1915. From the Louis Biamonte finds. Image courtesy of the Provincial Archives of Alberta A10913. Do not reproduce. Edmonton’s pre-First World War building boom attracted Italians with trades. Oral history accounts refer to a Mr. Zuchett [Zucetta], an Italian mosaic artist, who worked on the terrazzo floors of the Alberta Legislature. Provincial architect A.M. Jeffers studied at the Rhode Island School of Design before moving to Edmonton in 1907 and was familiar with Italian tradesmen working in New York. Jeffers supervised work on the Legislative Assembly from 1907-1912. Giacinto Arnano was a mason who immigrated to New York and worked on six-month contracts at the Legislature (workers were brought to Edmonton to work in the summer returning to the US in the winter). The Canteras were another family involved in construction. Mrs. Myra (Cantera) Butti reminisced in an oral history about her grandparents who raised pigs near their home in the Rossdale flats and watched the flood sweep houses down the river. Her grandfather immigrated to Wilmingdon, Delaware, and her father, Lorenzo, and his brothers went into construction arriving in Edmonton in 1912. Francesco De Filippo also worked on these projects as well as the old Royal Alexandra Hospital. Thus, through the words of various seniors, now deceased, we get an image of Italian immigrants getting a foothold in Edmonton and making do (the Italian word arrangiarsi). This attitude helped them rise to the challenges of making a living in a country that begrudged their presence. Avery, Donald. “European Immigrant Workers and Labour Protest in Peace and War, 1896-1919.” The History of Immigration and Racism in Canada: Essential Readings. Edited by Barrington Walker. Toronto: Canadian Scholars’ Press Inc., 2008, 125, 126. Bonifacio, Tony. “Venice Alberta 1914: The Pioneers and Others that Lived There.” Unpublished history of Venice, ca.1990s. Davies, Adriana A. “Edmonton’s Italian Community.” In Celebrating Alberta’s Italian Community website. Heritage Community Foundation: Alberta Online Encyclopedia, retrieved May 20, 2016. ————. A Settlement History of Alberta. Unpublished manuscript, 2011. Hylo-Venice History Book Committee. Hylo-Venice: Harvest of Memories. Hylo, Alberta: Hylo-Venice History Book Committee, 2000. Mary N. B. Boyle Fonds, 1912 – . Provincial Archives of Alberta, PR1372. Olde Towne Beverly Historical Society. “Francesco (Frank) and Ermelinda De Filippo” in Olde Towne Beverly Historical Society website, retrieved June 10, 2016. Palmer, Howard. “Strangers and Stereotypes: The Rise of Nativism 1880-1920.” In The Prairie West: Historical Readings, 308-337. Edmonton: Pica Pica Press, University of Alberta, 2nd edition, 1992. Perin, Roberto, and Franc Sturino, eds. Arrangiarsi: The Italian Immigration Experience in Canada. Montreal: Guernica Editions, third edition, 2006. Ramirez, Bruno. “Antonio Cardasco,” Dictionary of Canadian Biography online, retrieved June 10, 2016. Stirling, John T. Report of Coal-Mining Industry Commission. Edmonton: King’s Printer, 1919, Peel 4534, Peel’s Prairie Provinces, University of Alberta, retrieved June 10, 2016. Sturino, Franc. Forging the chain: a case study of Italian migration to North America, 1880-1930. Toronto: Multicultural History Society of Ontario, 1990. Dante Alighieri Oral History Collection, 1973-1974. Provincial Archives of Alberta, Accession No. PR0915. Italians Settle in Edmonton Society Oral History Collection, 1982-1983. Provincial Archives of Alberta. Heritage Community Foundation, “Celebrating Alberta’s Italian Community Oral History Collection,” 2001 – 2002. University of Alberta Archives, unaccessioned. See Donald Avery, “European Immigrant Workers and Labour Protest in Peace and War, 1896-1919,” in The History of Immigration and Racism in Canada: Essential Readings, ed. Barrington Walker (Toronto: Canadian Scholars’ Press Inc., 2008) 125, 126. Bruno Ramirez, “Antonio Cardasco,” Dictionary of Canadian Biography online, retrieved June 10, 2016. “Francesco (Frank) and Ermelinda De Filippo” in Olde Towne Beverly Historical Society website, retrieved June 10, 2016. Canadian Encyclopedia online. “One Big Union.” retrieved May 20, 2016. See John T. Stirling, Report of Coal-Mining Industry Commission. Edmonton: King’s Printer, 1919, Peel 4534, Peel’s Prairie Provinces, University of Alberta, retrieved June 10, 2016. Gisella Biollo in Hylo-Venice: Harvest of Memories (Hylo, Alberta: Hylo-Venice History Book Committee, 2000). Adriana A. Davies is a researcher, writer, editor, and poet who has worked in the heritage field for over forty years. Recent publications include The Rise and Fall of Emilio Picariello (2016) and The Frontier of Patriotism: Alberta and the First World War (co-editor, 2016). She is a Member of the Order of Canada (2010) and a recipient of an Italian knighthood (2015).